Iran's rial plunged against the US dollar in open-market trade on Monday, taking its loss in value over the past week to more than a quarter in further evidence that Western sanctions are shattering the economy. The freefall suggests sanctions imposed over Iran's nuclear programme are undermining its ability to earn foreign exchange and that its reserves of hard currency may be running low. The rial traded at 34,200 per dollar according to currency-tracking website Mazanex, down from about 29,720 on Sunday. It was trading at 24,600 last Monday, according to website Mesghal. There is no clear sign that economic pain in Iran has reached levels that would prompt the government to compromise on its nuclear programme, which Western nations say aims to develop an atomic bomb but which Tehran insists is peaceful. 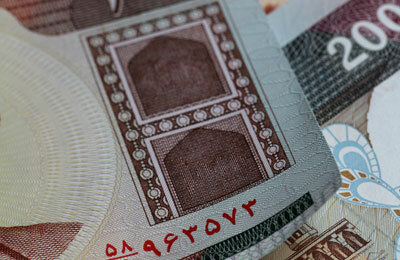 However, the currency crisis is exposing President Mahmoud Ahmadinejad to criticism from enemies in parliament. The rial's losses have accelerated in the past week after the government launched an "exchange centre" designed to supply dollars to importers of some basic goods at a special rate slightly cheaper than the market rate. Instead of allaying fears about the availability of dollars, the centre seems to have intensified the race for hard currency by linking the special rate to the market rate, meaning that even privileged importers will face sharply higher costs. "The government's initiative ... brought to the surface a tremendous lack of confidence in its ability to manage the currency," said Cliff Kupchan, a Middle East expert at the Eurasia Group, a political risk research firm. "The attempt to fix it triggered a worse crisis via market psychology." The rial's sinking value will fuel inflation, officially running at about 25 percent; economists estimate the real rate is even higher. Rising costs could worsen the job losses which Iranians say are hitting the country's industrial sector. On Sunday, Israeli Finance Minister Yuval Steinitz said Iran's economy was "on the verge of collapse" and estimated the government had lost $45-50 billion in oil revenue because of the sanctions, which have slashed the country's oil exports and largely frozen it out of the international banking system. But that kind of language is premature, said Hassan Hakimian, of the School of Oriental and African Studies of the University of London, because Iran has stockpiled some basic goods. "I am not aware of any shortages of basic necessities as yet," he said. "Well before that, the government will resort to some kind of basic rationing so as to introduce a safety net." Some Iranian officials continued to insist on Monday that the exchange centre, which is supposed to be funded by dollars earned with Iran's oil exports, would eventually meet demand for hard currency and thus strengthen the rial. "The exchange centre is operating and once the next phase of the plan is implemented, the price of currency will drop," said Gholamreza Mesbahi-Moghaddam, who heads parliament's planning and budget committee, according to the Mehr news agency. But the rial's accelerating slide indicates many Iranians have lost faith in authorities' ability to support it, and are scrambling to buy hard currencies to preserve their savings. "There is very little, effectively, the central bank and authorities can do to calm the situation because even when they take extraordinary measures to calm the market ... the market interprets those additional measures as a sign of abnormality," Hakimian said. At the end of last year, Iran had $106 billion of official foreign reserves, enough to cover an ample 13 months of imports of goods and services in normal times, according to the International Monetary Fund. But Nader Habibi, economist at the Crown Center for Middle East Studies at Brandeis University in the United States, estimated last month that the government now had about $50-70 billion of hard currency reserves left. Iran does not disclose timely data on its reserves but if they have dropped steeply, the central bank may have become reluctant to run them down by supplying dollars to the market. In a statement on Sunday, the central bank said just $181 million had been traded on the new exchange centre since its launch six days earlier - a fraction of Iran's imports of goods and services, which total around $2 billion per week in normal times. "The president has deliberately kept the market agitated," Elias Naderan, who sits on parliament's economic committee, said on Sunday, according to Mehr. "I really don't know what Mr Ahmadinejad is thinking. What plan does he have, what is his expectation of the system, and how does he plan to manage this disorder?" The crisis has also prompted criticism of the central bank and authorities by private businessmen.